If you’ve been considering adding rooflights or embarking on any architectural glazing project, there’s no doubt that summer is the best time to embark on your project. At VisionAGI we appreciate that better weather lends itself to getting the work done with minimum disruption plus you get to enjoy all the benefits of light-enhanced living at a time when available daylight is at its maximum. Usually our #1 reason for adding rooflights or embarking on any project that involves glazing such as a glazed link in your home or a frameless glazing extension, is to take advantage of all that additional light in our living space. Light is not only good for us, as we’ve previously discussed, but opens up living areas making them appear larger. We associate glazing and therefore light, with high-end properties and luxury. After all, we only have to jump on any architectural or interior design site on the web and take a tour of the homes featured on there to see how light features. While you may not be considering selling your home at the moment – there’s little doubt that the addition of rooflights or any other form of architectural glazing that increases the amount of light in your home, can add significant value to it. The size of your home affects its value. And no matter what size our home is, we can alter how large it may feel – whether it’s for ourselves to enjoy, or potential future buyers, simply by opening it up to more light. Even just one properly placed rooflight can make all the difference when it comes to upgrading our homes and adding ‘light value’. Opening up your home using not just rooflights, but a combination of these, glazing additions and even glass doors to create open-plan living areas, creates more usable space which is a big attraction for buyers if you are ever thinking of selling your home. Of course, all that additional light and space rather than market appeal, may be your main motive for embarking on your project in the first place. But it’s always good to have an eye on the future. 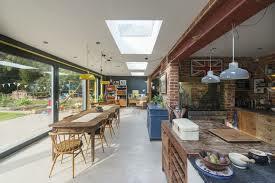 An open plan kitchen/dining room is becoming a ‘must have’ for many buyers. Feature glass doors which provide a seamless link between the interior and the outdoors also add to the illusion of more space. Owners of period properties such as Victorian terraces, have long been aware that creating an open plan kitchen/diner not only means they can have the lounge room as a tranquil area, but that creating an open plan space brings in more light into what traditionally can be darker living spaces. Creating the open plan space on its own can add 6% to the value of a property while feature architectural glazing can add even more.